Fall is here, though some days still have a surface feel of summer. Leaves are beginning to fall. Beautiful shades of maroon, gold, orange and yellow line some roads. 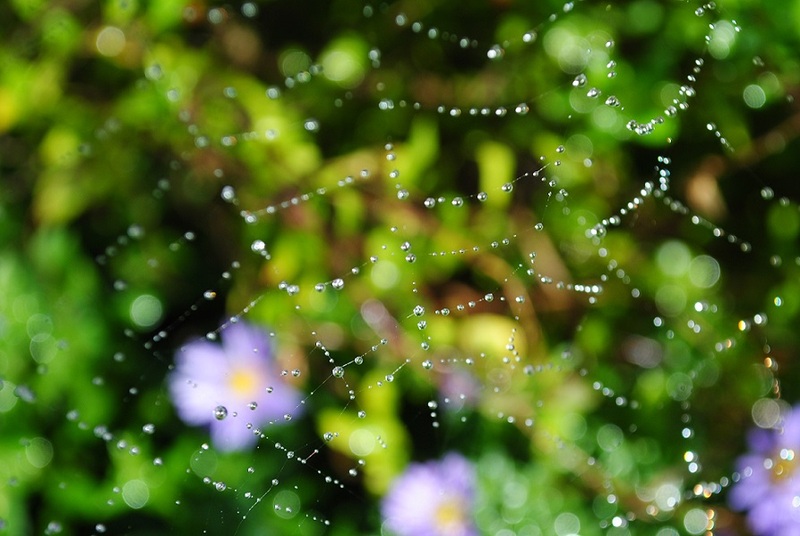 Spiders and spider webs are everywhere, or maybe they’re just more visible now. Fruits, meaning seeds, of various trees can be seen on the ground here and there. I found some fruits of the Chinese chestnut at Me Kwa Mooks Park, near Puget Sound in West Seattle. I recognized them instantly because there was a similar tree where I worked in Maryland. 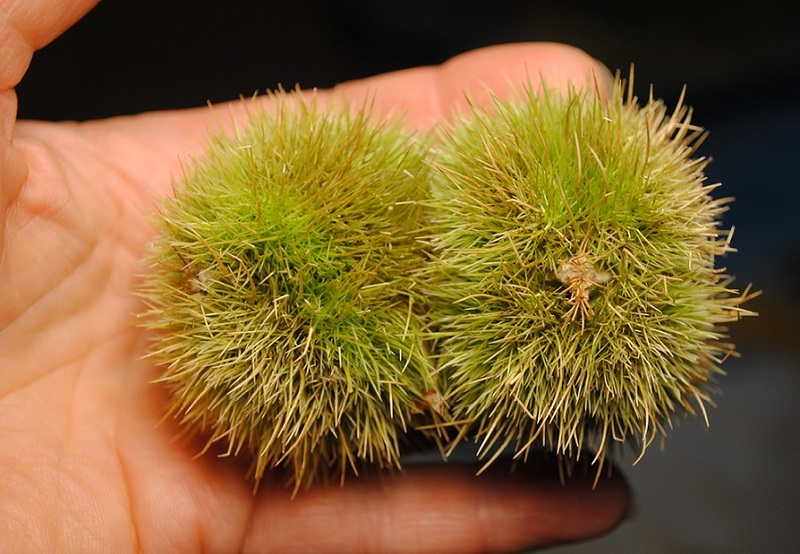 Years ago when I found the seed pod, I thought it looked like a chestnut – all spiky. I couldn’t believe the huge tree was an American chestnut because the trees don’t live that long. American Chestnuts do still grow here, but because of the chestnut blight, a fungus that made its way to this country in 1904, the species doesn’t survive past a few years. They were a mainstay of the Appalachian forest ecosystem. 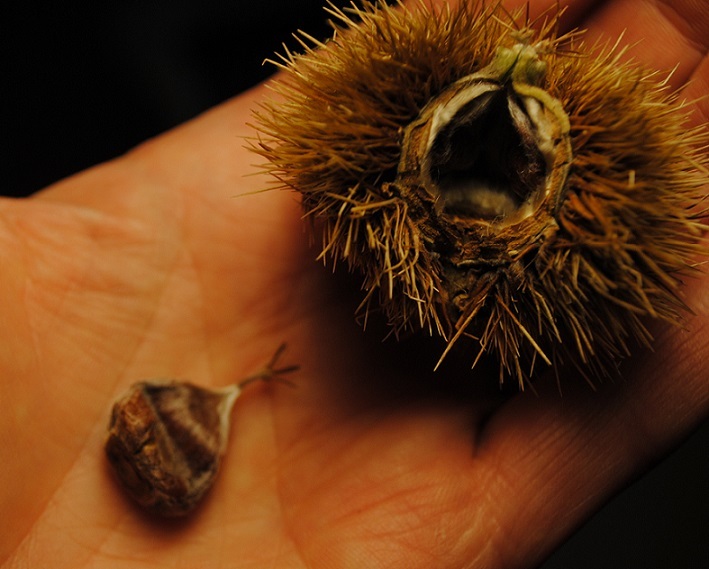 I researched the Maryland seed pod back then and finally discovered it was from a Chinese chestnut. Someone had planted the ornamental tree at the old homestead that predated our office building. It’s a good substitute for our American species, but it would be nice to have our old trees back. In fact, people are working hard to bring the American chestnut back. 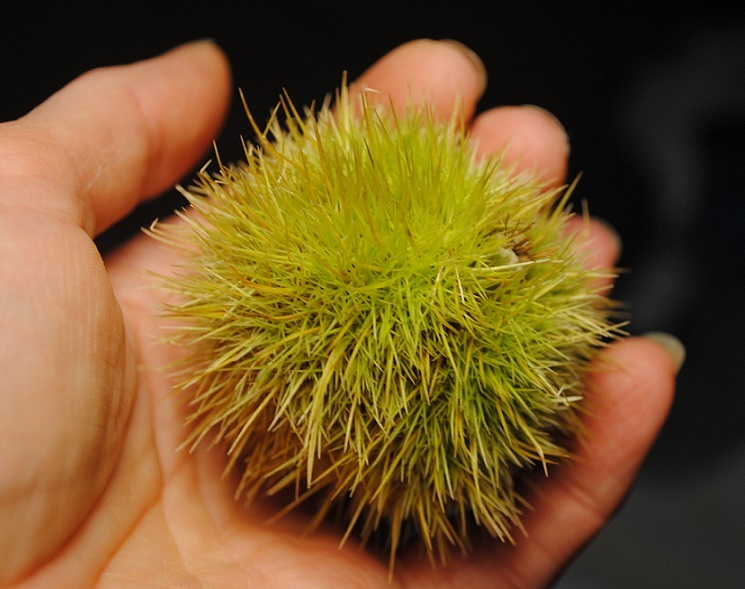 The American Chestnut Foundation is dedicated to restoring the species to our eastern forests. 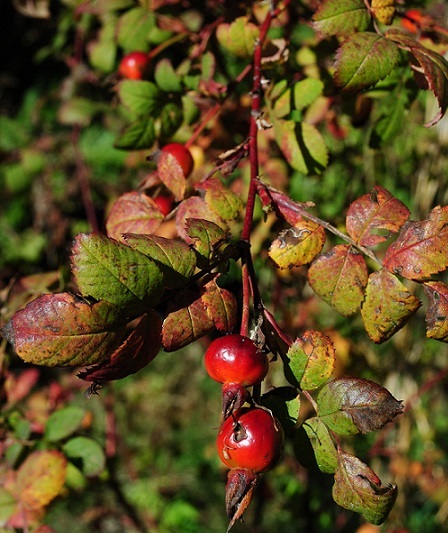 Researchers are breeding blight-resistant trees. It so happens that the Chinese chestnut is resistant to the blight, which originated in Asia, and the species makes an excellent donor of resistant genetic material. However, the Chinese tree does not have all the desirable characteristics of the American tree, such as a tall, straight growth habit. American chestnut is strong wood. It was popularly used for fences. Cross-breeding is tremendously complex and takes years and years. The Foundation’s goal is to breed for resistance, while preserving the desired native traits of the American species. Inbreeding is even a problem for trees. Researchers are using genetic material from American chestnuts throughout their native range, from Maine to the Carolinas. It will take years of testing before they may finally be able to start replanting American chestnuts across the region. There is hope! I was laying borders for a new flower garden in my front yard. I wanted to use long pieces of wood as the borders, but I ran into a lot of cedar tree roots on one side. I was not going to have to change my garden plan, and gave much thought to a solution. I finally decided to use bricks, which I could fit in between the roots, if I was lucky. As I was digging the trench for the bricks, I spotted a mass of gelatinous beads, like crystal-colored caviar, in the dirt where a brick had covered it. I pulled it out for closer examination, and realized it must be eggs. I should note that I’m talking about our common dark-colored, non-native slugs, not our native banana slugs, which live in the woods and are not garden pests. As I write this, a light bulb just went on in my head. Back in the spring, when I was preparing my vegetable garden, I had found some tiny orange balls on the soil. They reminded me of caviar. Something told me they could be eggs. There were singular ones scattered here and there. I couldn’t imagine what creature could have laid them there. I squished them and they popped. 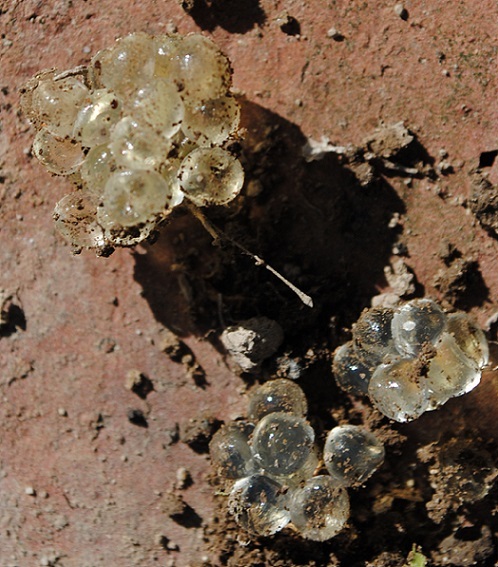 Now, after discovering the slug eggs, I am thinking the tiny orange ones were snail eggs! I have seen snails around, so I will assume they were snail eggs. You never imagine the tiny things that live around us, until you start discovering them. I once found tiny toads in the grass, no bigger than my fingernail, in a park in Virginia. The tiniest things in the grass, far from any water, so I assume they were toads. How I spotted them, I don’t know. More reason to walk softly on the earth. Back in my back yard, I noticed a blob of white beneath one of my mock oranges. At first, I thought it was a dropped tissue. But when I knelt down I found it was a mushroom! And then I saw that there were bunches of them ringing my shrub. In all my years at the house, I have never seen these mushrooms. They are low white orbs, in small clusters here and there. I touched one; it was very soft. I found a couple small ones connected together lying on top of the soil, so I picked them up and inspected them. They felt like marshmallows! Soft, fluffy and light as air. 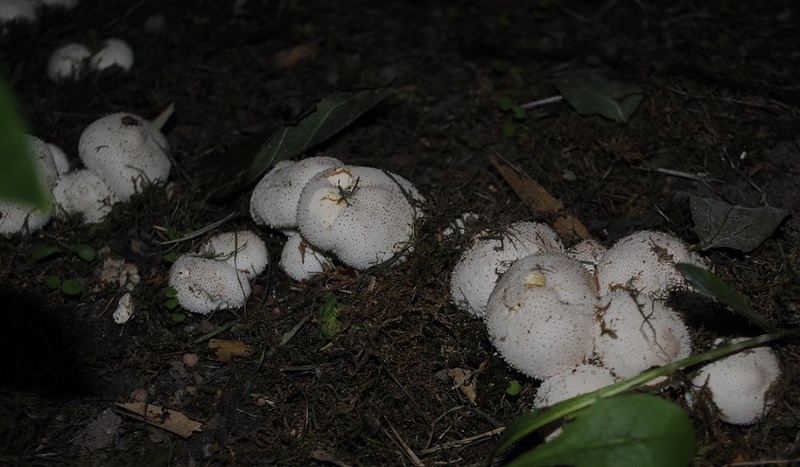 After some research, I identified them as gem-studded puffballs! They sprout from July-October. They are supposed to be edible, but I dare not try them. The mushrooms are the ‘fruits’ of the web of fungus on and beneath the soil. 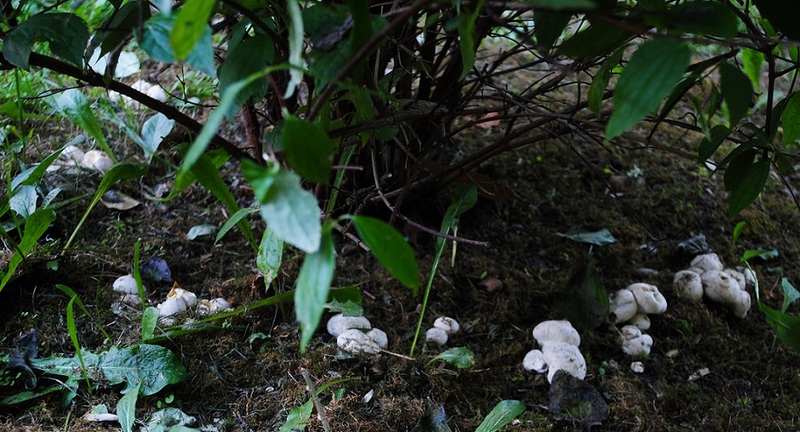 The mycelium can extend a long way through the soil, so no telling where the puffballs might appear. 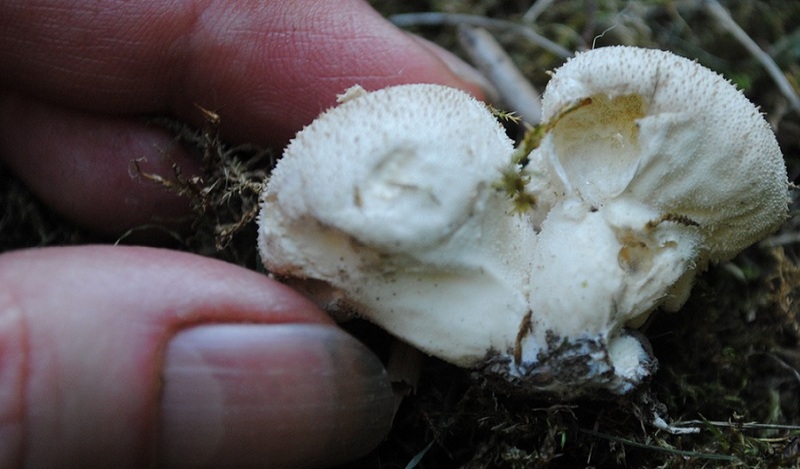 Puffballs have the habit of releasing their spores in a puff of dust from a hole in the top. Now that they’re in the soil, I will keep an eye out to see whether they reappear next year.